Buy some material, such as a glitter fabric .You will also need clingfilm, sticky tape, scissors, leather adhesive and string. Cover the heel in clingfilm to make a template for the glitter fabric. Then cover the whole heel area with sticky tape. Making sure that the whole heel is covered, draw around it with a marker pen - this will act as a pattern for the glitter fabric. 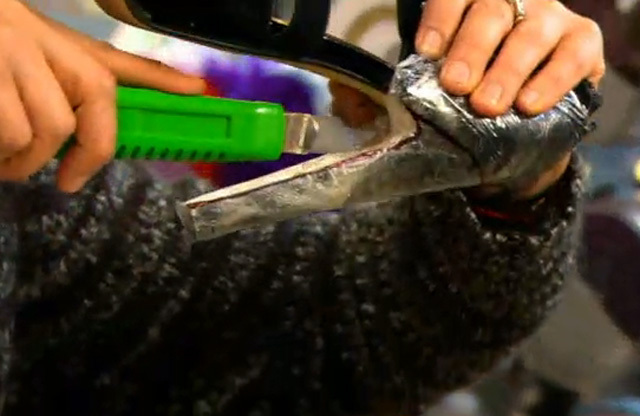 Using a stanley knife, score the clingfilm down the back of the shoe and open it up. This will act as your pattern. Cut out the pattern and use it as a stencil on the glitter fabric. Draw around the stencil, cut it out and check it fits. Apply leather adhesive to the heel. Wait until the glue goes tacky to the touch. Stick the fabric to the heel and trim off any excess pieces. Tie some string around the heel to secure the fabric in place. Leave it to dry for five to 10 minutes.